Speaking from the heart is something I practice hourly to myself and the very few people I trust wholeheartedly. That said, I’m about to open up publicly about something very private to me: my reaction to receiving my kiddo’s diagnosis of Down syndrome. The moment I discovered my pregnancy, I was overwhelmed. I knew it would be a tumultuous path full of difficult turns with grand spectacles. This is still true for me today. It just seems that the turns are more rocky, tighter, and seemingly impossible. I was at work providing job coaching to a client who receives Supported Employment services. I’ll never forget sitting in a chair at that job site knowing I’d never look at anything the same again. But, how could this be? I was 26 years old. No one in the family had Down syndrome. I later learned I had a 1:1200 chance with any given pregnancy for me. With the test, it dwindled to 1:100 chance. More testing. 97:100. Then, the last test gave me the 100% confirmation. And then depression hit like a tidal wave. I had been working in the disability field for several years at that point. But, I’ve known people with disabilities since birth. Every one of my family members has a disability. It is part of who I am. Fast forward to me sitting on that chair getting the news from a rushed nurse who didn’t think to ask me if now was a good time to talk. I had a good job. I loved my job. I loved my clients. I loved my coworkers. They were family to me. 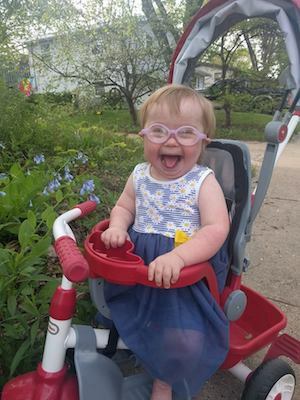 But, I knew that my daughter would have Down syndrome. And I’d be blurring the lines of my professional and personal lives forever. Who was I to become? When it was known that my daughter has Down syndrome, I received many different types of reactions from people. Well-intentioned comments were made that I’d be the best person for my daughter since I knew the disability field and could navigate the systems. Let me tell you — that stung harder than ignorant comments. Well intentioned or not, I was grieving. I was grieving for the adversity my husband and I would face. I was grieving the battles for support we’d need. For the looks we’d get in public. For the health complications. But I was grieving the most for my daughter’s future tears. Every kid feels left out at some point in their life. It’s part of life. But, I know that society at large still doesn’t understand that disability is most often a falsely salient label that distances ourselves further than the other person next to us who just happens to not have a disability. What will happen on her second day of school? Her classmates may treat her differently. Maybe not; I won’t jump to that conclusion. What happens when her friends physically and developmentally outgrow her? It’s exhausting to make friends. It’ll be exhausting to make new friends every year or two. But, I can’t think that far ahead now or I just might implode from the weight of it. Atlas held the weight of the world. I think it’s overlooked that an atlas is a tool to help us navigate our journey. That’s how I feel with my kiddo. I will carry the weight of her adversity and offer her guidance. Just as many parents would for their kid. There are differences in this world and there are similarities. But, most differences are just what the eye of society perceives them to be. What is to become of my daughter? My kid arrived and things changed forever. This is true for every new parent. It is a hell of a birth story and even more of a postpartum story that includes me nearly dying three times. If not for medical treatment, I would not be alive. Nor would my daughter. My daughter has been through hell so many times. She has been hospitalized more times than I can recall. And yet her resiliency prevails. She still smiles and gets so excited to see people, her dogs, and favorite toys. I’ve seen her with oxygen, in a jaundice box, in an x-ray lab, therapy rooms, in the OR, and so many places I didn’t want to be. That does make her different from others. That does not make me a saint or a heroine. It makes me a parent. A parent. All of these things can happen to any baby. It just so happened to be my baby. Thankfully, I’m an intelligent and empowered person to know when to question authority. And when to shut up. And that’s parenting. I’m a parent. A parent to my daughter…who happens to have unique needs. The view of watching my child flourish against all odds — genetically, physically, developmentally, and socially — is of the utmost beauty I ever thought possible in this world. She is the part of me I never knew I needed. With her in my arms, I feel complete, whole, and temporarily unbroken. Depression robs me of many things, but not everything. You may wonder why I’m posting all this on a public forum. The answer? What doesn’t kill me supposedly makes me stronger. And if laying it all out doesn’t help me cope, then I’m not sure anything can. And if anyone were to dare question my tactics, look out. This momma bear’s teeth are sharp. 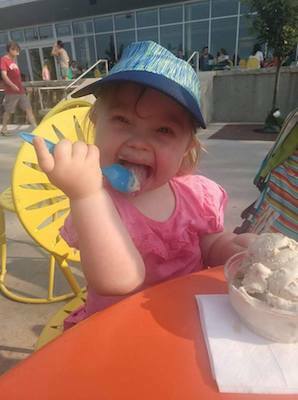 Jak and her family live in Wisconsin and enjoy eating ice cream all year long.